This article is directed at heavy clay wickets found in Australia and South Africa which have warm season grasses, however general clean up processes explained in here are still followed across the curating fraternity in Australia and internationally. Proper care of a cricket pitch post match is vital for it to recover and maintain its integrity for years to come. Failure to do so will result in organic matter build up (thatch), hollowing out of the ends (batting crease/bowlers landing), poor turf recovery, general pitch unevenness, along with affecting pace & bounce. This can also lead to undesirables elements in the pitch such as disease and weeds. The level of your clean up should revolve around the machinery you have available, when the wicket will next be used and if any issues were identified. 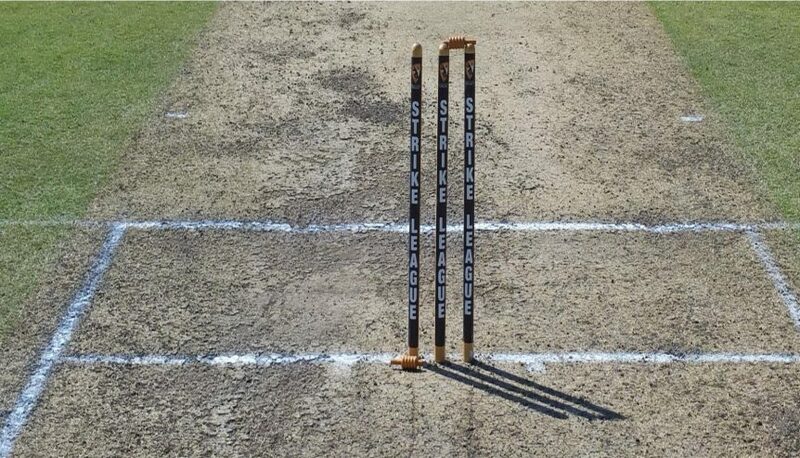 Once a match has been completed, the first course of action is the decision of when you will clean begin maintenance on the wicket. It is optimal to clean the wicket up as soon as possible to aid the recovery of the turf with deep watering and return any lost moisture to the clay profile so that the table is in the best possible shape for preparation on the next match. In club land, you have to accommodate what your timings are and if you are a club/part time/volunteer curator, try to find the best solution for you to ensure the best recovery of the wicket. Use either a yard vacuum or rotary mower on the lowest setting to clean up debris lifted from rake/broom. Fill areas that have been kicked out during the match with with fresh fine clay (preferably processed to <5mm in thickness). If you identify any small low spots on the pitch you can also fill these areas, ensure that you are not putting the clay over the top of organic matter or turf (fresh clay is going on to the existing clay profile). The pitch cleaned up with a rotary mower (acts as vacuum) and the ends filled with with clay, ready to be rubbed in with a lawn leveler. This pitch was being used again in a couple of days so minimal clay was used. Use the lawn leveler to rub the fresh clay in and even up the surface. The reason I irrigate the pitch on a Sunday night is because I want to get the turf growing as soon as possible and it also helps to lift any grass clippings out of the clay which are then easier to remove during the clean up process. This also based on my location being in Darwin, NT where cricket is played in the Australian winter. When a match finishes as scheduled at 6pm, you would have 20 to 30 minutes of good light to do the above with cricket played on the pitch on both days of the weekend which leaves you limited time to complete your work. Also a point to consider if it is the first day of a two day match, depending on the dead organic matter on the pitch, you can avoid using the scarifying rake/brooming the wicket for the first week of maintenance. However, if grass snakes are prevalent, I would recommend raking/brooming the pitch regardless. Grass snakes are where grass clippings/matter clump together after flooding the pitch. Grass clippings prevalent after the pitch has been irrigated. Anecdotal evidence from my observation is the turf recovers quicker through this method than potentially waiting another 12 hours, with the bare areas only taking a couple of weeks to fill in. Darwin also experiences heavy dew all year round and cleaning up on a Monday morning can get a little messy, so leaving it to the afternoon would be a further couple of hours without water. From my position in Darwin, I would recommend the above method as a part time curator would need to only attend the ground for approximately an hour or so on Monday afternoon before returning for preparation on a Wednesday or Thursday morning. However, in different areas of the Australia, weather conditions vary, along with the opportunity to do this on a Sunday if there is no cricket on your ground. You should be full aware of what is going to ensure you can adequately clean up a pitch after the match. Lightly irrigate pitch only to lift stuck clippings. Let dry or to a slightly tacky state before proceeding. Fill areas that have been kicked out during the match with with fresh fine clay (preferably processed to <5mm in thickness). If you identify any small low spots on the pitch you can also fill these areas, ensure that you are putting the clay over the top of organic matter (fresh clay is going on the existing clay profile). Doing a full square clean up and leveling three wickets to be used in a couple of months for an Australian test camp. You can do the 5 and 6 process as much as you want to get the most even surface possible. This is a couple days after a full pitch clean up and being put to bed for later in the season. A couple of tips with your clay, if you can’t get it in finely processed option, so it is coarse greater than 5mm in size. Top dress the pitch as per step five but also run the heavy roller or light roller over it up and then repeat step five again. If your clay still doesn’t break down to a workable size, the next option is to give it a light water, the clay will absorb the moisture. Let dry, this may mean coming back the next day, from here you can either run the heavy or light roller over it again and then repeat step five. If you don’t have a light roller, you can use your cylinder mower (do not have the blades running and either lift the cutting height so the bedknife doesn’t hit any bits of clay and/or lean the machine back while moving so that the front roller is lifted). Fresh clay will tend to swell more than the existing clay profile, so be careful filling the kicked out areas on the crease and bowlers follow through especially if you are using the wicket the following week as you might have little hills that could end up being stuck to the barrel when you do your first roll. To finish, clean up is important and for you to get the best out of your pitch, you need to ensure you remove detrimental elements to the wicket after use along with your normal pre-season renovation and top dress. I would also recommend giving the square a light scarify and vacuum mid season along with an end of season clean up. Unless there are any major lows in the pitch, I would not top dress at the end of the season because you’ll be wasting time, resources and money. As per all the articles that I’m writing, you have got to do what is best for your situation and if you can’t clean up a wicket until later in the week or the next week, it is still better than not doing it all. If there are any points, suggestions or tips that you use to help with you wicket clean up, fire away!